Nineteen Vancouver Pen Club members (including two newcomers---Alice and Martim) came out to our September meeting, held on Thursday September 21st. 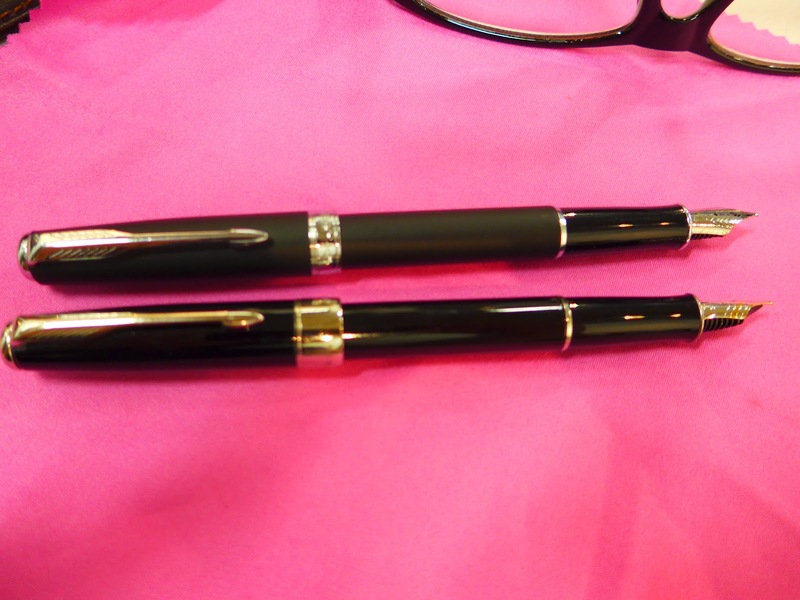 Many thanks to Richard for the use of the venue, and to Jerred for his donation of two Lanbitou '3059' fountain pens (more on this cool pen in the post below) as door prizes, which were won by Marzieh and Ricardo! Mindy's trusty Pilot Penmanship fountain pen (far left), her clear Wing Sung 659 and the real thing---a new bright red Pilot 78G+ (a newer version of the now-discontinued Pilot 78G that is available with an XF nib and comes with a CON-40 piston style converter, in place of the CON-20 squeeze converter). 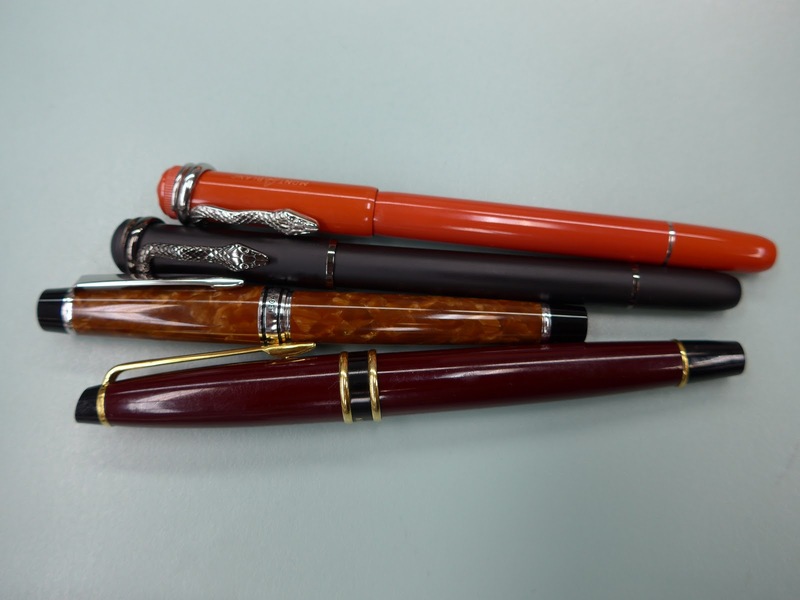 Not pictured: Mindy's Parker '61' clone, a Jinhao "Shark" fountain pen (a quirky tribute to the Pilot 'Penmanship'), as well as her genuine Montblanc Heritage Rouge et Noir fountain pen and its red clone (the latter was photographed at our June 2017 meeting---picture here). 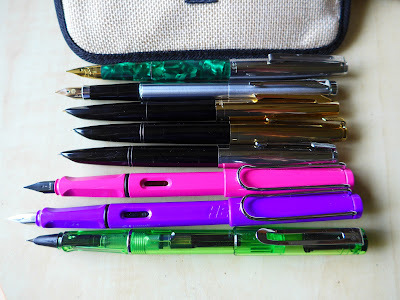 Stanley brought in lots of great examples for our topic, including some Jinhao '992' fountain pens (left-hand side of bottom row) that are clones of the Sailor ProColor, and some wonderfully-colourful TWSBI 'Eco' knockoffs made by Lanbitou (right-hand side of bottom row)- the Lanbitou 3059 models. Top row (L-R): Delike 'Alpha' (made of brass) and a Kaweco 'Sport', fake Parker Sonnet in the "Tartan" pattern and a real Sonnet, a real TWSBI 'Eco' and a Wing Sung '618'--a very cool knockoff of a Parker '51' Demonstrator! 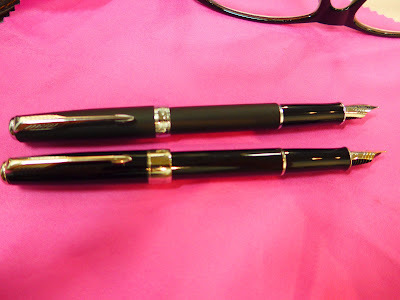 My (Maja's) collection of Montblanc (MB) knockoffs----copies of (top to bottom) MB Copernicus (which never came in green! 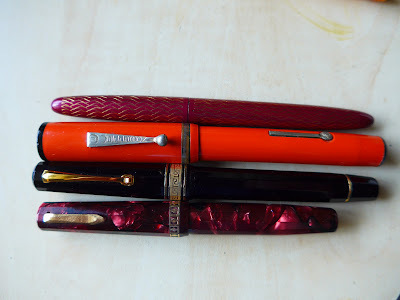 ), MB Heritage Collection Rouge et Noir (which never came in purple! 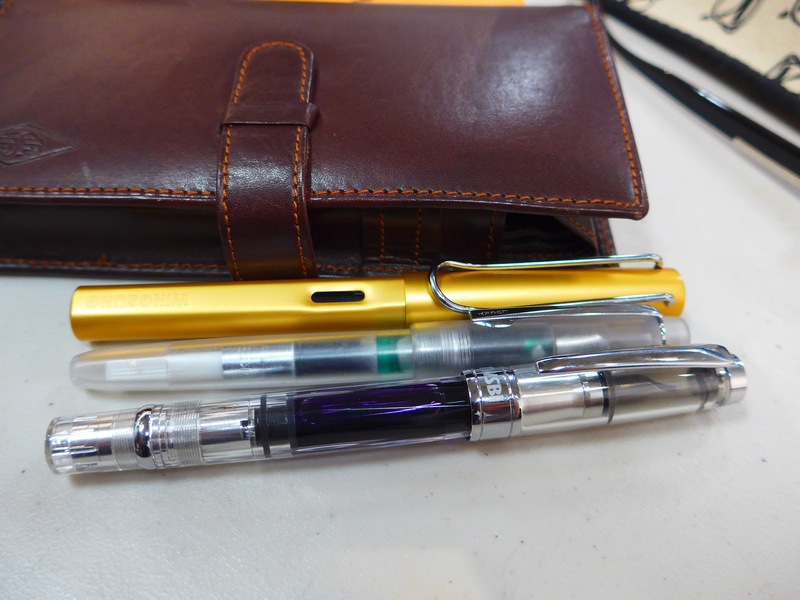 ), MB Starwalker, MB 147, MB Solitaire, and MB Bohème. 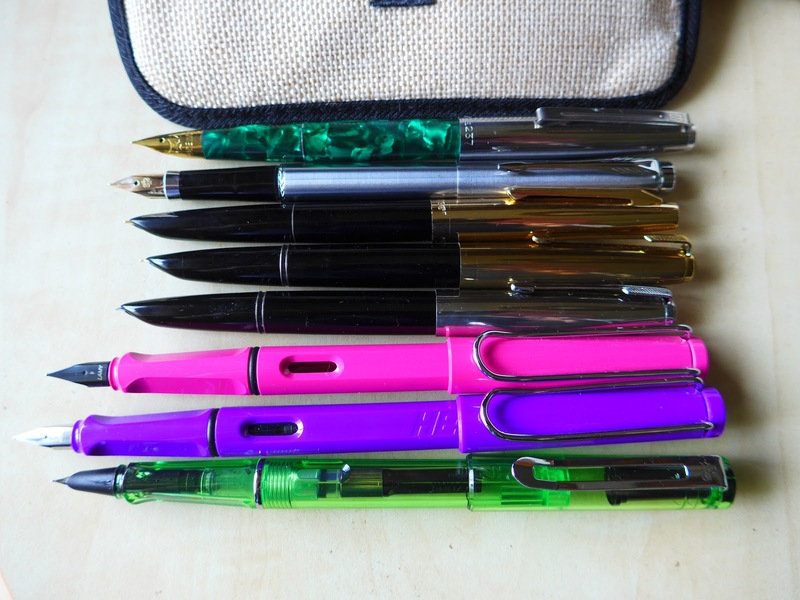 The only manufacturer's name on any of these pens is Baoer, found on the Starwalker clone. (Top to bottom): Recife fountain pen and a similar model made by Airmail (Wality), Parker 'Vacumatic' and its clone-- a lever-filling (!!) 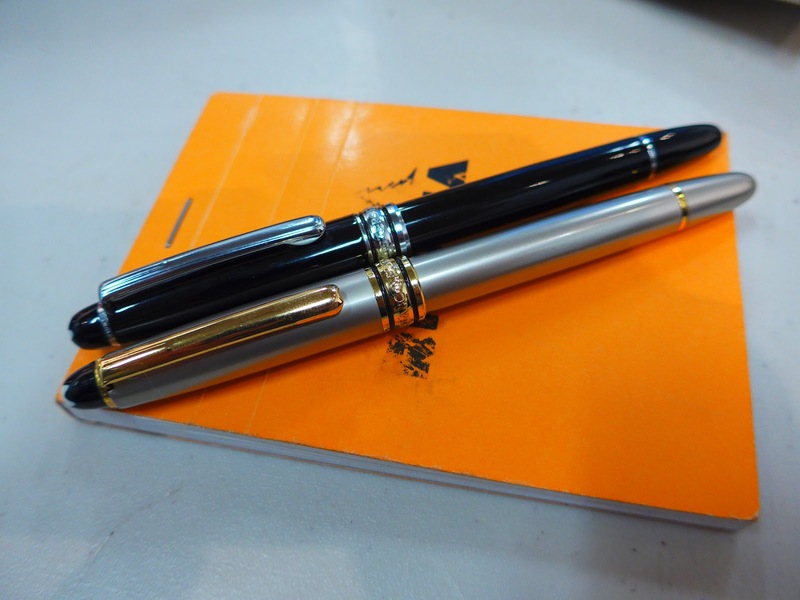 fountain pen made by "Foster", my beloved black Sailor Sapporo (aka Sailor Pro Gear Slim) and a clone by Delike called their "New Moon" model. 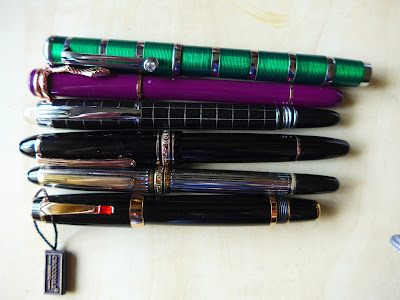 Even big, well-known vintage fountain pen companies copied each other! 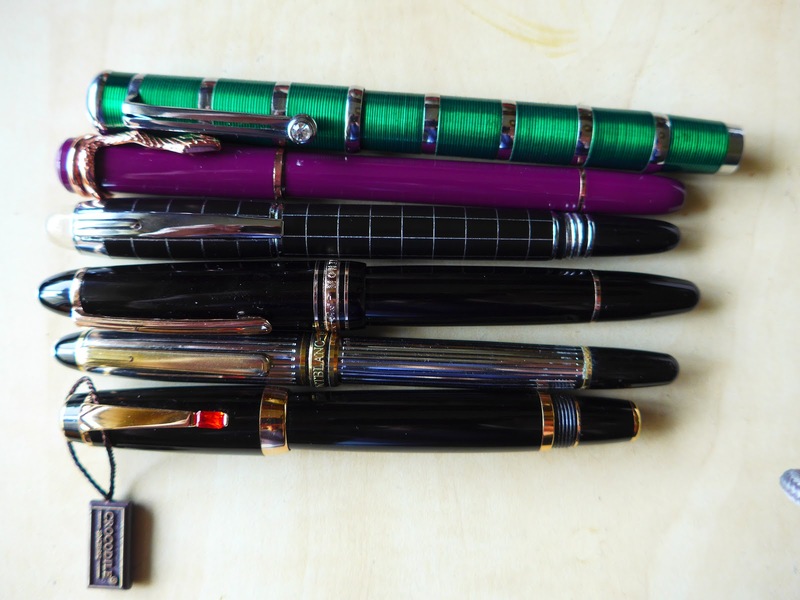 (Top to bottom) A Wearever "Lady Fair" (a lookalike of the vintage Sheaffer "Lady" pen in the Tulle pattern), a big Jefferson flat-top (a "tribute" to the famous Parker 'Duofold') an old-style OMAS Milord in black and its inspiration, the wonderful Wahl-Eversharp 'Doric'. I found an interesting post about the Wearever "Lady Fair" models here. 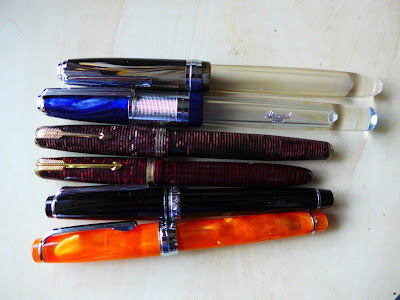 More of my knockoffs: (Top to bottom) Wing Sung 237 (note the conical nib, a tip of the hat to the famous vintage Sheaffer "Triumph" nib), Hero 200A (note the Parker '75'-like nib), Hero '336' (a Parker '61' lookalike), two Hero '616' Jumbo fountain pens (Parker '51' knockoffs), my real Lamy 'Safari' and its amazingly-similar clone by Hero (the Hero '359') and lastly, a Jinhao '599A' with hooded nib (which took some design elements from the Safari). 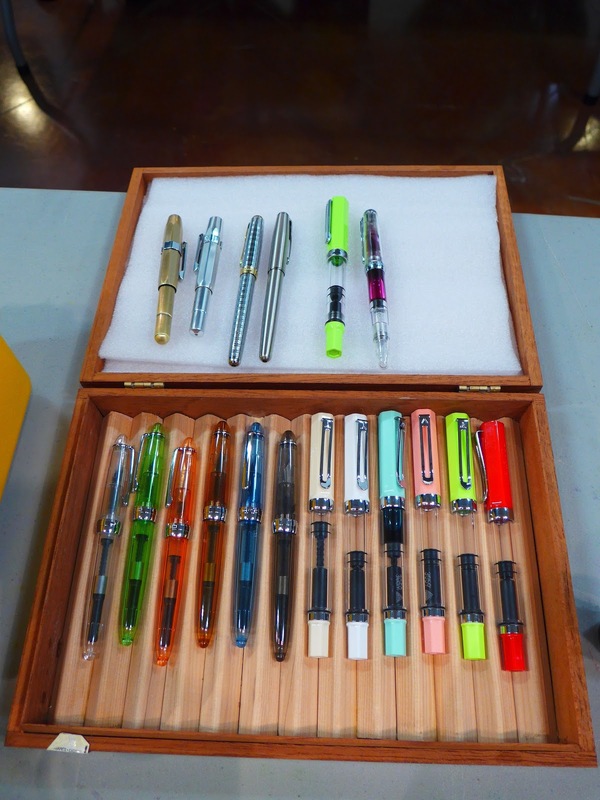 In addition to our monthly topic/theme, we always encourage members to bring in their newest pen-related acquisitions. 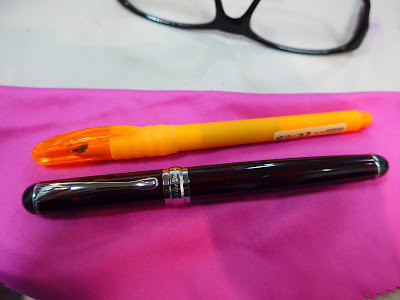 Here are two that Justin brought in---an orange fountain pen purchased at a Thinka store, and a Rosso Bianco fountain pen, obviously a copy/re-branded Jinhao X750, which he found at the Daiso store in Richmond's Aberdeen Mall. 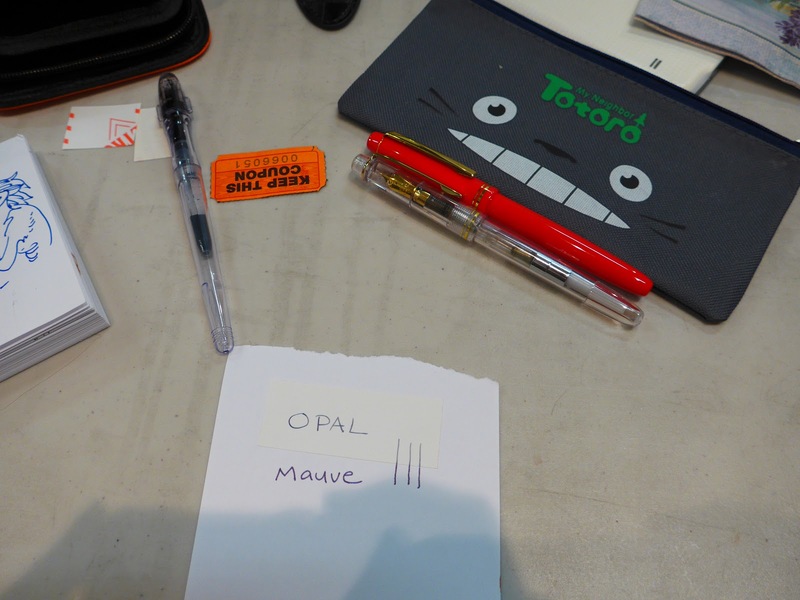 More September meeting photos coming soon!